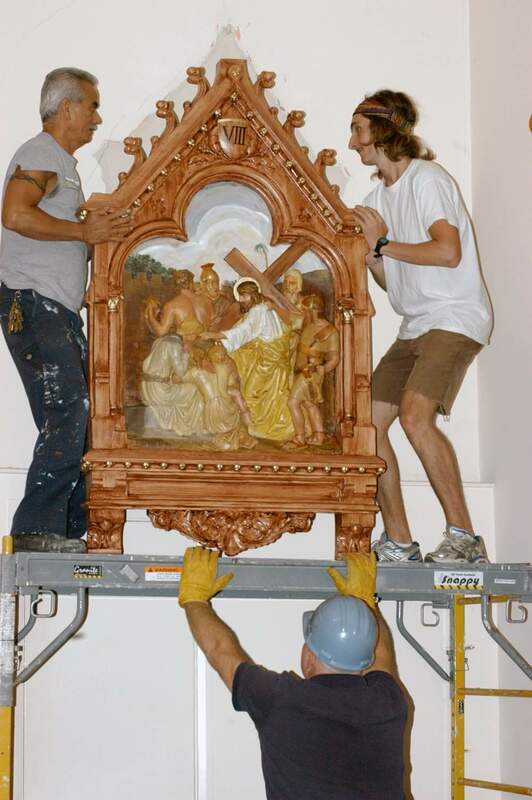 These photographs exhibit the best of Cave Company’s artistic and decorative capabilities, including extensive gold leaf application, detail stenciling, and the rejuvenation of statuary and marble. 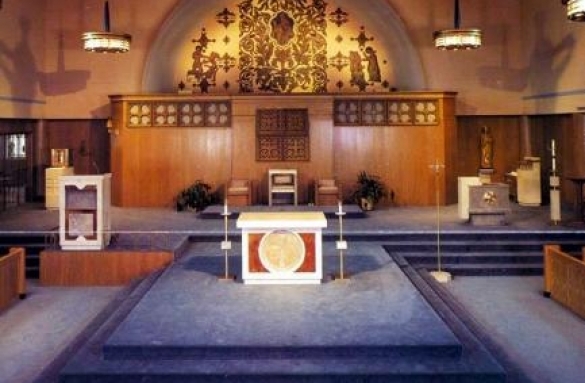 The marble appointments shown where previously altar rails and rear altars which were all re-cut and reassembled to meet the requirements of the new liturgical environment. 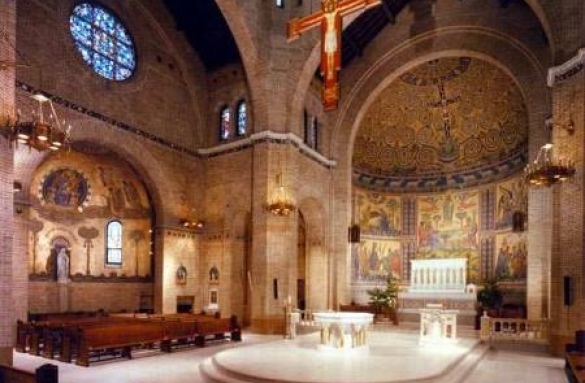 We take great pride in our craftsmanship so you can take great pride in your newly renovated sacred space! Call or write us with any questions you may have regarding sanctuary remodeling….we have the answers! Here is an example of our pew restoration as well as our fine art decoration including custom stencils and 24-karat gold details throughout. 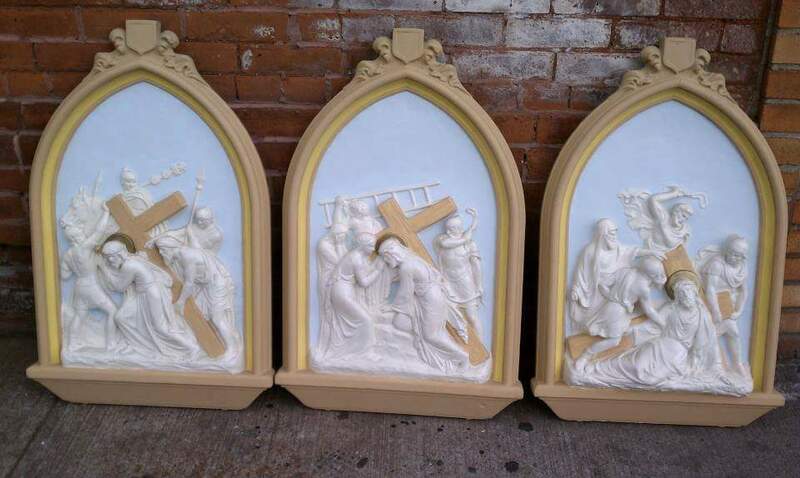 Let Cave Company restore your sacred artwork regardless of the poor condition they’re in, we can make them look brand new again. The investment is small and the outcome is spectacular. Please send us photos so as to quote on a complete restoration. 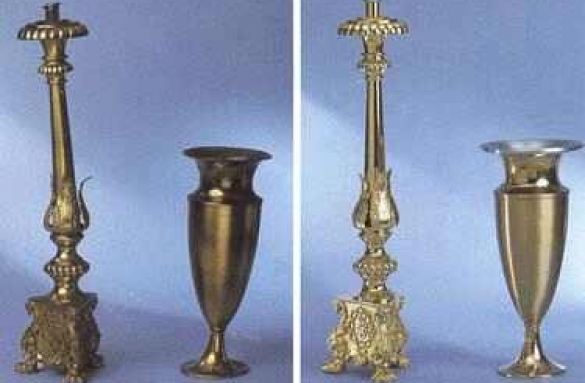 Most Metalware can be refinished for far less than the cost of new. Our craftsmen are trained to restore items of old manufacture, discontinued items and products of other manufacture as well as ours. 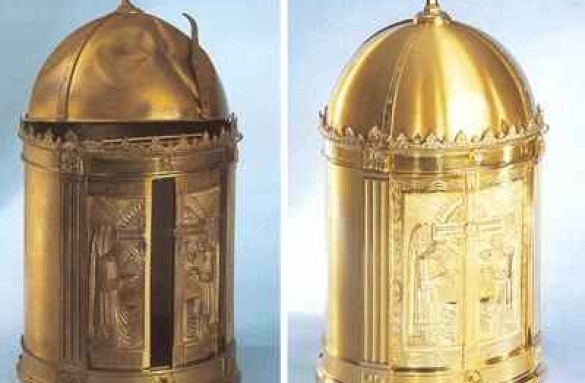 This tabernacle’s lock was destroyed when vandalized. The damage was repaired, a new lock installed and the entire tabernacle was refinished to a condition as good or better than brand new. 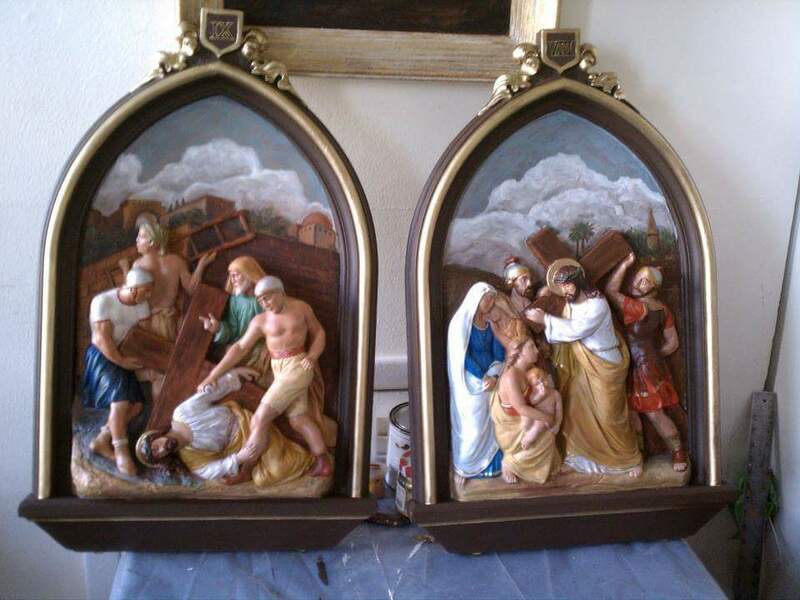 These items had been stored in a sacristy closet for years. We repaired the damage, refinished the items. The church now has “new” appointments and the congregation can enjoy service with “old friends”. 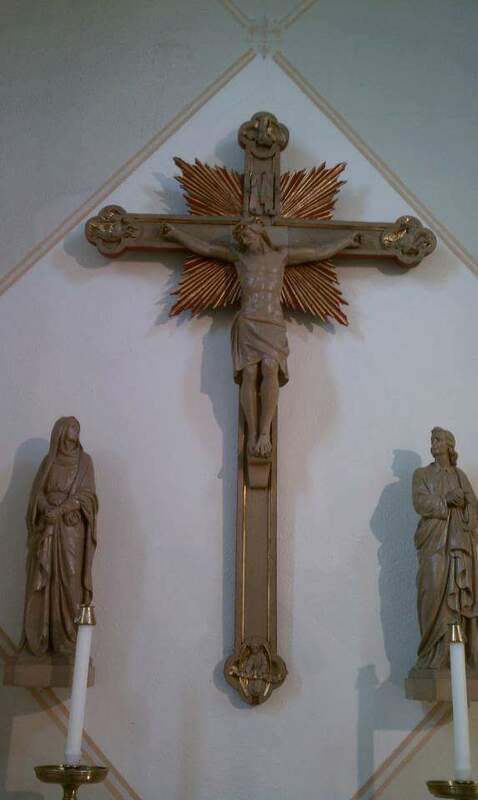 This old crucifix was broken when it was dropped. 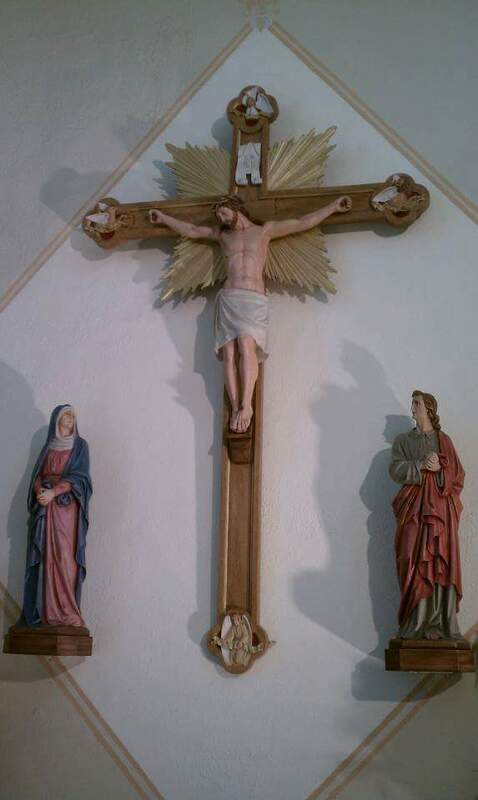 We repaired the damaged cross, added some coloring and a new stronger joiner. Old and antique pews are by far built better with longer lasting joints and construction than anything that is available new. 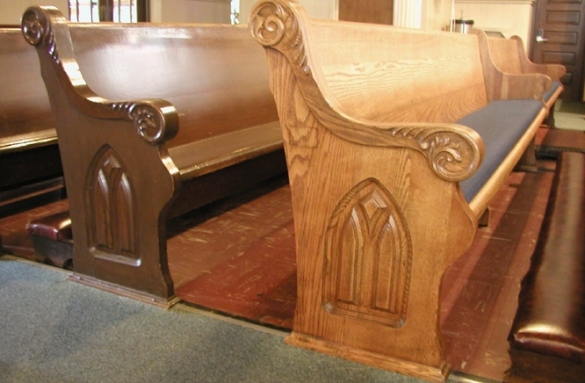 Cave Company will completely restore and refinish your church pews, regardless of their existing condition. Please contact us for details. We specialize in on-site and off-site restoration.